I believe this may be the exact moment I looked up and saw myself on the jumbotron. One thing I didn’t mention in writing about my LASIK surgery yesterday and Wednesday was the somewhat wacky lengths I went to to get it. Like embarrassing myself on the jumbotron at a hockey game. 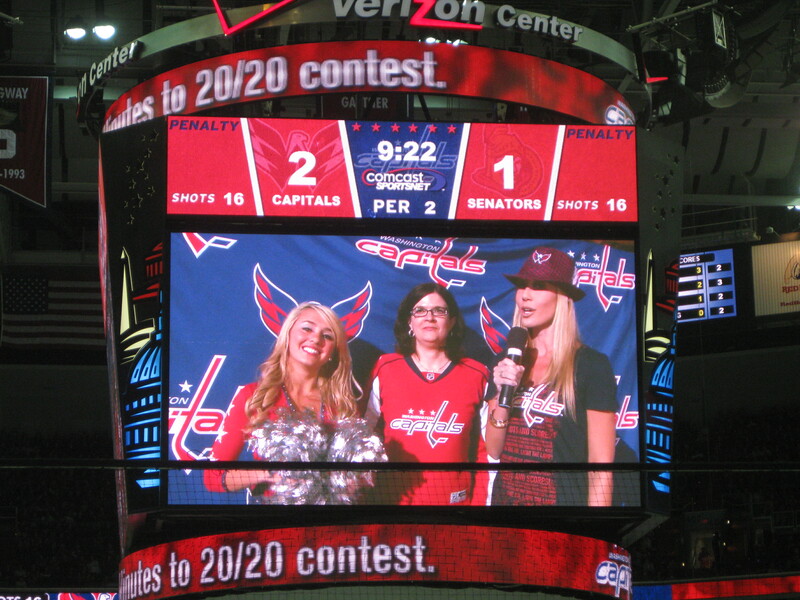 At every Caps home game, there’s a promotion called “two minutes to 20/20” sponsored by Eye Doctors of Washington. Unlike many promos at sporting events, it does not involve the participant doing anything humiliating, like riding a tricycle on the ice or wearing a giant puck suit. All you have to do is say your name on the big screen, and hope the Caps score within the last two minutes of the second period. If they do, your LASIK is free… and if they don’t, you still get $1,500 off. I decided to give this a try last spring, and went to get my pre-screening. I qualified, but all of the slots were already filled for the regular season. I was told I might get the call for a playoff game, which I eventually did. Because it was the playoffs, though, there were no free tickets to the game included, so I was given the chance to participate without actually having to be up on the screen. It seemed like the best of both worlds – a chance to win with no one staring at me. Unfortunately, the Caps didn’t score the necessary goal in that game, and I didn’t win. At that point, I figured that was pretty much it… Even with the discount, I didn’t have enough in my flexible spending account to pay for the surgery, so I knew I’d have to wait until 2012. Much to my surprise, however, I got a call from Eye Doctors of Washington in September, offering me another chance. They didn’t have anyone signed up for the first few regular season games, so were giving the playoff contestants another chance. This time, though, I’d be at the game and would have to go up on the jumbotron. This didn’t seem like that big a deal. All I had to do was stand there and say my name, right? My assigned game was October 15 against the Ottawa Senators. I wasn’t nervous at all, but I’ll admit that I did spend a little more time doing my hair and makeup before the game than I would have ordinarily. At the beginning of the second period, I was whisked across the arena by one of the “Red Rockers” to await the time out when they announced the contestant. I chatted with Guerin, the impossibly tall and perfect-looking woman who is the onscreen personality at the games, and finally it was go time. And this is where things went wrong. As Guerin is explaining the promo, I made the mistake of looking up at myself on the jumbotron, and I froze. Completely. She handed me the microphone to say my name and I said “Sarah Hmmmernmmm.” (Where Hmmmernmmm = unintelligible gibberish.) I mush-mouthed my own name so badly that after the camera turned off, Guerin turned to me and said, “Did we spell your name wrong on the screen?” Uh, no, dear. You did not. Oh, and I can not help but comment on the…ahem, cheerleader…with her sparkling silver ta ta’s and her devil wings perfectly framing her golden locks…that’s priceless. Same observations made here …. Too funny!!! And, you didn’t tell on yourself until NOW. Hmmmm …. Entertaining on so many levels! A great laugh to start our weekend – thanks! And why were Eileen & Mom posting around 2-3 AM?????? Making very bad sleep choices!